This class started with a test on whether you can detect the direction bias will take, based on who or why a valuation is done. The solutions are posted online on the webcast page for the class. 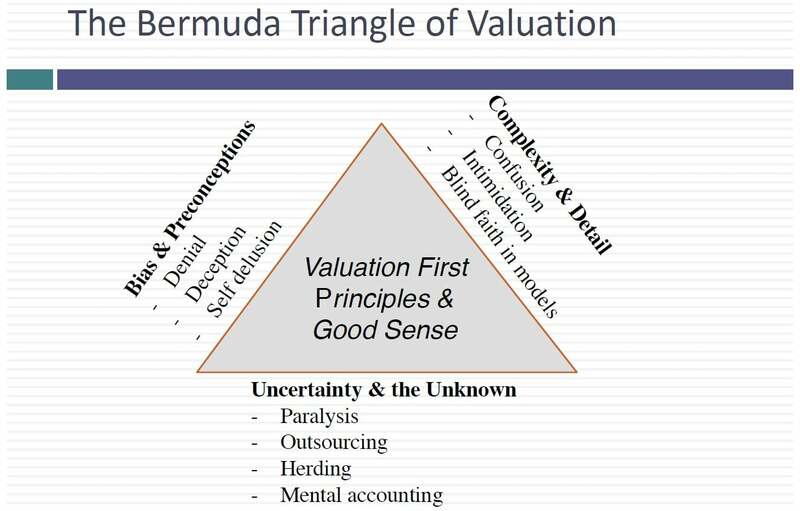 We then moved on to talk about the three basic approaches to valuation: discounted cash flow valuation, where you estimate the intrinsic value of an asset, relative valuation, where you value an asset based on the pricing of similar assets and option pricing valuation, where you apply option pricing to value businesses. With each approach, we talked about the types of assets that are best priced with that approach and what you need to bring as an analyst/investor to the table. For instance, in our discussion of DCF valuation and how to make it work for you, I suggested that there were two requirements: a long time horizon and the capacity to act as the catalyst for market correction. Since I mentioned Carl Icahn and Bill Ackman as hostile acquirers (catalysts), you may want to look at Herbalife, the company that Ackman has targeted as being over valued and Icahn did for being under valued. See if you can get a list going of how each is trying to be the catalyst for the correction… and think about the dark side of this process. What I hope to show through these steps is you already know what we're going to conclude at the end of 80 minutes and this is not something you couldn't have figured out on your own. I'm just going to give a little guidance along the way. Some someone to start today's test with what I think is perhaps the biggest enemy of good valuation let's start with some basics. We have more data today than we have ever had in history. 35 years ago, I remember when I tried to value a company I had to write for an annual report. I did write to the company can you please send me an annual report because you're not a shareholder didn't even get an annual report. And if you didn't live in New York you'd go to the FCC office to get the 10k. So getting data was painful. And I think I might have done my first valuation on the ledger sheet with an abacus. No I was not. I'm not that old with a calculator. Talked to the more powerful data is more expensive. But the quality evaluations actually in my view has become worse. And one of the reasons I think is what I want is the topic that I want to start off with today which is bias and preconceptions. The reality is none of us ever sits down to value a company with a blank slate. We bring everything we read learn about the company into our valuations with I'll give you a personal example to bring this home. I have valued Microsoft every since 1986. That's the the IPO. Every every single time I've ended Microsoft. I found it to be overvalued. You name the price two dollars for six dollars overvalued overvalued overvalued. Now I can give you access to every single valuation done on Microsoft and you could dig through those valuations looking for clues as to why a funded overvalued to be looking in the wrong place. If you really want to see why I've found Microsoft to be overvalued every year for 32 years all you need to do is walk up to my office. The door is open you can walk in take whatever you want but look around and you'd see a bunch of computers more radiation than I should be taking and all with the fruit a picture of a fruit on the back. I've been an Apple user since 1981 in fact in my office. I have my very first Mac. It's a 128 k. For those of you never seen it. It came without a hard. It came with a swappable desk. You'd have a program disk and you'd type in your document and then you'd eject the program desk and put in another this to say and there was this moment of complete panic where you had no idea what it was going to happen but I've got it in 128. And to me Microsoft has always been the Darth Vader of technology. Let me be specific in Star Wars stunts. I am not talking and can Skywalker Darth Vader I'm talking dark Darth Vader the guy who never takes a shower dresses a black strange voice lot of bad thoughts about Bill Gates and when I said undervalued Microsoft all those bad thoughts come bubbling up to the surface because in valuation you're constantly coming to a fork in the road. High growth or low growth. My reaction to Microsoft's who'd buy this rotten product low growth high risk or low risk. One virus away from blowing up High-Risk by the time I make my choices. No surprise I find Microsoft to be overvalued you know what that tells me. I'm far too biased to value Microsoft and I have to be aware of it. I can make it go away in fact who had some far too biased to value the story. And I sent you my apple valuation yesterday Rick buyer beware. In fact I've been valuing Apple every since 2011 on my blog. And if you go back and look at my very first valuation of Apple in 2011 I've been valued for a lot longer. But that's a first. I spent half the post telling people not to trust me. I said don't trust me. I love the company too much and by the way here's my valuation of Apple. In fact two things you're often asked to do in valuation jobs actually makes us from worse. What's the first thing you're asked to do. Learn more about the company. Read up whatever you can about the company. Be careful what you wish for because the more you read about your company especially its opinion the more your biases are getting nailed down you also told to talk to the management of the company and god help you if you like the CEO.